During the early years of the 20th century the subject of socialism was widely and eagerly discussed in the United States. Eugene V. Debs, socialist candidate for president, polled close to 1,000,000 votes in 1912—the equivalent of approximately 3,000,000 votes in the 1948 election. 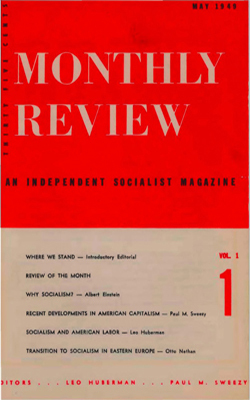 The popular interest in socialism was reflected in an enormous sale of socialist literature. The Appeal to Reason, a weekly, had a circulation of more than 300,000 for several years; pamphlets by Oscar Ameringer were printed in editions of hundreds of thousands; books by Bellamy, Upton Sinclair, and Jack London ranked with the best sellers of the day.